It is almost that time of year again and doesn't it seem to come round quick ... and without fail every year it catches me out. I start off with such good intentions and then before you know it ... it's here. But at least I have got all my orders for Christmas cards completed and out of the way. I have also done all my family cards too so I can relax about that now, and to be honest I am really fed up of making Christmas cards. To get into the spirit of the season we took all four generations of our family for a day trip out to Grassington. This little village dresses up for the Dickensian Festival, and it is held on the the first three Saturdays in December. We hired a mini bus and had a fabulous day out. It is an amazing atmosphere, with choirs dotted around, Morris Dancers and lots of stalls selling delicious food, mulled wine and hot chocolate as well as gifts. The atmosphere is lovely and when it goes dark there is a torchlight procession through the village with Mary on the donkey and Joseph by her side.... played by some of the village children. It is well worth a visit and the highlight for us was the "Human Vegetable Machine". It was hilarious and the three people in the screened booths had to produce the same veggies. If three matched then you were a winner and our grandaughter won £5. Mind you she put it all back in again for the fun of watching the antics. I started my retirement on the 21st November and was presented with a lovely bouquet of flowers. It really makes a difference to me now that I can work from home and I love it. With the extra time I now have to work on my website I have been busy adding tutorials. This one will give you another way to send some candles as a gift and you still have time to make them for Christmas. Candle Gift Box is easy to follow and if you have the graph paper you can make the boxes to whatever the size of the item you want to add. Many of us have collections of Mica Powders and they and be used in lots of different ways. But this tutorial will show you how you use them to great effect by Painting with them. 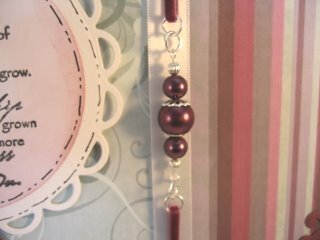 Just lately I have been playing around again with Beads and really enjoying my self in the process. 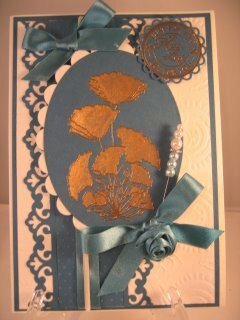 I have added several small items that can be added to the card to give it a unique feel and I am really pleased with the look. It was a good way to use up some thin velvet ribbon that I have as it is impossible to tie it into a decent bow, but also impossible to throw away. They are reasonably cheap embellishment and yet so much can be done with them. Have a look at the items I have made and see what you think. ... to my request for more information on the photographs that are being added to the Gallery Page. Many of you did just that and now lots more info is being given that will help "Newbies" to card making get the look they want. Thank you again in advance for your efforts, and please keep adding both the photos and the info. So all that is left to say is thank you so much for all your support in 2011 and I hope you will continue to visit the website in 2012. Card Making Magic will be three years old in March and still grows every month ... thanks to all you lovely people. Have a really good Christmas and I will be back with another newsletter in the New Year.